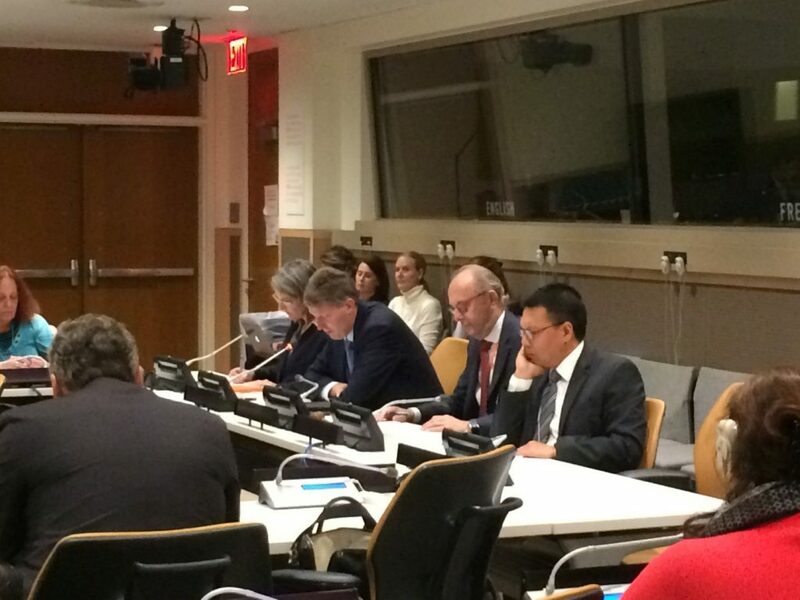 On 16 October 2018, a briefing on the review cycle of the Treaty on the Non-Proliferation of Nuclear Weapons (NPT) took place as a side event of the General Assembly First Committee. The joint presentation was led by Chairs of the 2017, 2018 and 2019 Preparatory Committee (PrepCom) sessions for the 2020 NPT Review Conference, and it was hosted and organized by the Permanent Missions of the Netherlands, Malaysia and Poland. Joining the briefing in lieu of the 2017 PrepCom Chair, Ambassador Robbert Gabriëlse of the Netherlands began the session by describing his Government’s positive cooperation with Poland during the PrepCom’s second session in April and May 2018. Ambassador Dato’ Muhammad Shahrul Ikram Bin Yaakob, the Permanent Representative of Malaysia to the United Nations and the Chair of the PrepCom’s upcoming third session, expressed his sincere hope regarding the designation of a President for the 2020 Review Conference by the 2019 PrepCom. Making a point raised repeatedly throughout the discussion, Ambassador Yaakob said the nomination was urgently necessary to allow a head start on substantive preparations for the Review Conference immediately after the third PrepCom. He stated that he would meet with delegates of States parties in Geneva and Vienna to prepare for the 2020 Review Conference, and he expressed a wish to also hold regional consultations in South East Asia, Latin America and Africa, subject to funding. Ambassador Adam Bugajski, Permanent Representative of Poland to the United Nations and Chair of the PrepCom’s second session, said he shared Ambassador Yaakob’s concern over the still-vacant presidency. He addressed the role of States outside the NPT, and he separately underscored the critical contribution of the International Atomic Energy Agency to the success of the Treaty. Ambassador Bugajski expressed appreciation and encouragement for civil society’s strong voice and participation in the NPT review process, and he suggested there was room for more input from industries experienced in peaceful applications of nuclear technology. Ambassador Bugajski also commented on developments in the Middle East, describing a strong sense of polarization among NPT States parties about how to tackle relevant regional concerns. He added that in addition to these political dilemmas, States parties are also addressing technical and practical issues that sometimes make progress difficult, as made evident by the situation in the Middle East. He added, however, that the overall outcome of the 2018 PrepCom was “substantial” and the fiftieth anniversary of the Treaty’s opening for signature was a significant factor in spurring progress. Ambassador Bugajski ended by stressing that nuclear weapons are now back on the agenda of mainstream politics and media, and we are all responsible for working towards nuclear non-proliferation. Later during the discussion, Ambassador Yaakob downplayed any prospect of engagement with States outside the NPT on nuclear non-proliferation issues. He further expressed his desire to focus on implementing and improving the Treaty in its current form. Ms. Marjolijn van Deelen, head of the Non-Proliferation and Disarmament Division of the Ministry of Foreign Affairs of the Netherlands, presented three main talking points—namely, the importance of the NPT review cycle, the importance of NPT working methods and the regional approach to the NPT. Describing the NPT as the cornerstone of the nuclear non-proliferation regime, Ms. van Deelen emphasized its role as an “umbrella treaty” offering many tools to ensure the safety and security of the Netherlands. She further stated that the NPT has enabled a system of arrangements and agreements that is challenging to navigate. She suggested that at the 2019 PrepCom, States parties should focus on areas of convergence of opinion to pave the path for 2020. Ms. van Deelen admitted that the process of the PrepCom is not very efficient and that many States parties have expressed a desire to look for improvements in working methods. Reaching consensus is crucial for making progress, and Ms. van Deelen said this process can be accelerated through the prompt designation of a President for the 2020 Review Conference. The panelists concluded by thanking the governments of the Regional Conferences and expressing the hope to achieve positive progress in 2019.